The historical <?xml:namespace prefix = st1 ns = "urn:schemas-microsoft-com:office:smarttags" />Jaffa Road linked Jerusalem with Jaffa Port, along a route still used today. All along Jaffa Road there emerged sites of trade, business, and entertainment, transforming the road into the main lifeline of the city. 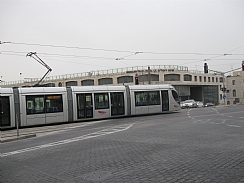 Recently a new light rail was built along this central corridor of Jerusalem, which is now changing daily. We will trace the tracks of innovation and initiative in Jerusalem to the historic yet modern center of the city. We will seek out old and new stories and hear what Jerusalemites do just for fun. We will hear about a Jewish convert who opened a business, a movie theater that became a bank, a clothing store that began as a faraway German dream, a French wall mural, and the first light rail in Israel. The tour may be combined with a group trip on the light rail.